Objective: The aim of this study was to investigate the prevalence of fascioliasis in humans, cattle, sheep, and goats, done by a systematic review in Iran. Methods: Fifty articles were extracted including Iranian papers such as Google scholar, Magiran, Iran Medex, SID, and Pubmed. Out of these, 21 articles were selected for meta-analysis. Essential information for meta-analysis was extracted from papers and archived in Excel software for calculating by statistical analysis. The variance of each study was obtained using the binomial distribution. Heterogeneity of the studies was surveyed using I2 index. Data were analyzed using a random effect model. Results: Of 21 collected papers, 1,275,506 samples from cow (507,152), sheep (454,882), goat (207,925), and human (105,547) had been surveyed in Iran. Eight studies were conducted on humans and 13 on animals. The prevalence rate obtained in humans was 3% with a confidence interval (CI) of 95% (1%–7%). Prevalence rate obtained in cows, sheep, and goats was 13% with CI of 95% (10%–16%). The highest level of prevalence was reported from cities in the North in animals with a prevalence of 14%. The highest level of prevalence was reported from Gilan in humans with a prevalence of 0.1%. 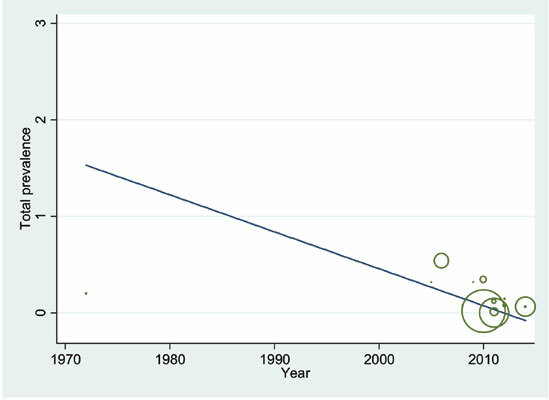 Conclusion: The prevalence of the Fascioliasis in Iran has reduced in recent years, But the importance of the disease has not reduced and there is a possibility of an epidemic. Furthermore, in many cities of Iran, there is no study on the disease. Fasciola hepatica, animal fascioliasis, prevalence, systematic review, meta-analysis, epidemic.